Are you interested in starting your own collection of your favorite vintage wines? Do you want to create a small wine bar space in your home or office? Create your own compact wine bar space in your home or office, even in small apartments and condos! 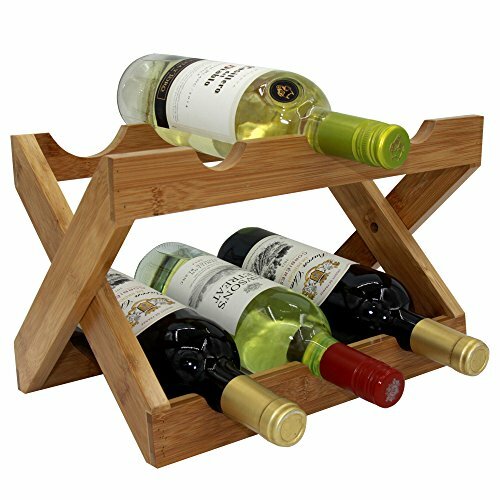 This elegantly crafted all-natural bamboo wood wine rack is a home accent that is neutral in color, natural in fiber, and designed with two shelves with cutouts that hold up to 6 bottles of your favorite vintage! Experts agree that storing wine bottles on their side without disturbing the sediments is the best way to enjoy clean, fresh taste when you open the bottle! The unique crisscross style is sturdy and won't wobble on the countertop, and is strong enough to safely showcase your wine bottles or for entertaining! If you have space above or below your cabinets, you could even line up more than one for a larger wine collection! The wine rack is compact when open, measuring just 13.5"x7.9"x8", and closes for storage to a narrow13.5"x11.5"x 2.75" size that will store easily in your cabinet or pantry! If you are looking for a wonderful wedding or housewarming gift, this is a perfect choice. Click "Add to Cart" now, and start showcasing your favorite wines in style! If you have any questions about this product by AUTREE, contact us by completing and submitting the form below. If you are looking for a specif part number, please include it with your message.